Hi friend! I hope you’re having a lovely week. In today’s world chronic stress is something that people wear with a badge of honour. Cramming your days to the brim with work, sports, social events, and activities can leave you feeling burned out and sick. Thankfully you live on a beautiful, giving planet full of herbs that help your body adapt to stress so that you don’t have to feel the negative effects of excess stress hormones, such as inflammation and the dreaded “spare tire” of tummy fat. 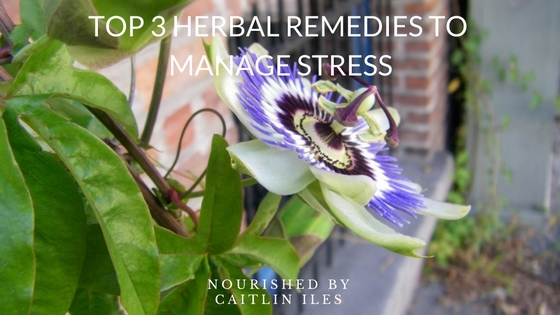 Today I want to share some of my favourite herbs for stress management and how they work in the body. They work best when combined with targeted self-care rituals and a whole foods diet! Long used in Ayurvedic medicine as a tonic and general rejuvenator, Ashwagandha has the reputation as an herbal preparation that promotes a youthful state of physical and mental health and expands happiness. Nutritionists and naturopaths refer to it as an adaptogen, whose primary function is supporting your body and adrenal glands during times of stress by enhancing your body’s natural resilience to physical and emotional stress. Try buying the powdered root to incorporate into this Stress-Busting Hot Cocoa or a Life-Changing Maca Matcha Latte. Stress and anxiety can keep you from getting a good night’s sleep, which in turn decreases your ability to adapt to stress, leading to a self-fulfilling prophecy of fatigue and overall ill-health. Passionflower is one of the best herbs to take before bed if you’re someone whose mind just won’t turn off and let you sleep. It’s great for reducing anxiety and promoting relaxation via its actions on GABA levels in the body. You can take it in either tea or tincture form just before bed to help you sleep or if you want to manage chronic stress and anxiety try taking a couple of smaller doses throughout the day. This herb has historically been used as a remedy for depression and anxiety and science is backing up what traditional wisdom has known all along. A meta-analysis of studies comparing this herb to SSRIs (pharmaceutical drugs used to treat depression) demonstrated that it was just as effective as these drugs in treatment, but was safer and had fewer side effects. For those who may suffer from Seasonal Affective Disorder, St. John’s Wort also helps alleviate some of the symptoms so that you can enjoy every season Mother Nature has to offer! Try taking this herb as a tincture to manage symptoms. Well that’s all for today, friend. I hope you have a beautiful week!